Just a wee thread to take our minds off the shambles that is the FAI. I was at the Euros in 2016 and seeing Belgium and Sweden light up the stadia in their countries' colours was fantastic. 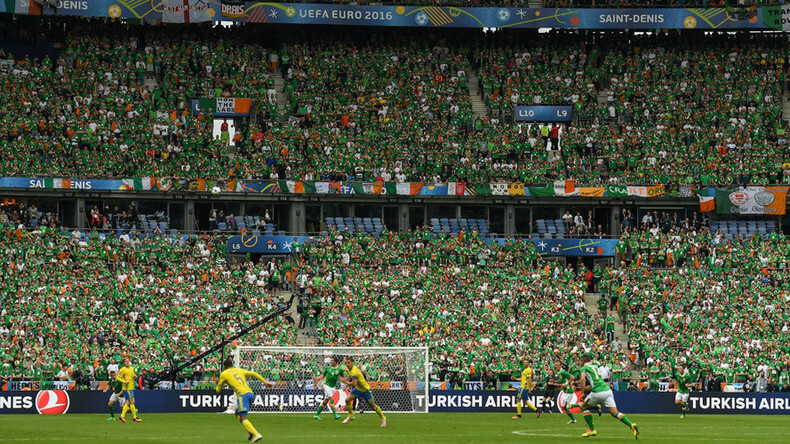 In contrast, half of the Irish crowd were wearing white away jerseys and so didn't colour the stadium as such. If you were looking from the other side of the stadium you'd say they liked like neutrals. I must say, it really gets to me. We should have a sea of green at matches but I reckon lads preferred to look cooler by wearing the trendy away jersey. Or those stupid white EURO 2016 polo shirts with a tiny tri-colour not them. Wouldn't take much. Green stands out like. Celtic shirts all round ? I usually prefer the white away shirts. The reason is that I don't like the shade of green usually used for the home shirts. The 2010-12 home shirt being the utterly glorious exception. Ya the green is way too dark, especially on the one around 2008 i think. Puke. The white one complements all ye lads with Beer Bellys, but makes someone of my physique and given my age fairly fit. So I'll keep wearing the white. If it was all white it would still look good. All one colour would be good. I'd prefer it darker. This is the one I was saying I liked. That's the one I hate!and it fits awful. BUT...we are Ireland! We wear green. Let's show our support by having a sea of green no? The Dutch, Swedes etc can look like they're taking over a stadium by everyone wearing the one colour. Can we have Paddy's blue please. Much more pleasing colour on the eye especially for roundy people like my self. Should we start wearing clogs as well? Over the years we,'ve spent far to much time trying to copy whatever we think works in other countries rather than being the best Irish fans we can be. The singing section try. I'm not getting at them. The place would be like a convention of undertakers at times without them. The songs we sing are too bloody repetitive. A bit of variety would go a long way. I'm fairly open to suggestions as to what could go in to the songbook. At the height of McGregors fame the stadium DJ tried to give us a hint and played The Foggy Dew at a few games but it seemed to go over everyone's head that if the stadium themselves were playing it there was obviously no issue in us singing it. I don't recall them playing Grace in Lansdowne Rd but it's been on a Rod Stewart album without any controversy. I'm not suggesting the place sounding like a Mick Conlan fight (or a sing-song with Vol. Delaney) but some of the songs from the Rising and War of Independence are perfect for us. Not trying to copy anyone. Just would like more people to wear green at Ireland matches cos that’s the team’s colour. And what a glorious colour it is! Last edited by DeLorean; 15/04/2019 at 3:16 PM. Still, should be no issue playing it in Ireland. Our best shirt since Italia 90.